I have already discussed the need for Biblical law and Biblical judges. Now I want to turn to some specific changes that should be made to the American judicial system based on the Scriptures. The first change may seem odd, but I think it is essential. One problem with the American justice system is the failure to punish false witnesses. I would put those who bring frivolous lawsuits in the category of false witness. A man can bring a charge, ruin someone’s reputation, spend thousands of dollars of taxpayer money, and get away free, even if he loses the case and is shown to have lied. I know their are perjury laws, but these do not compare with the Scriptures required punishment for bearing false witness. The Scriptures place bearing false witness on par with adultery and idol worship. It is not a minor issue to lie about someone’s character or about what they did. Therefore if a case is brought and someone is found to be lying or purposely trying to destroy a company or individually by deceit then whatever they wanted to happen to that company or person should happen to them. Adopting this policy would do two things. First, it would greatly reduce someone’s desire to bring frivolous lawsuits or to press charges when they are unsure of the other person’s guilt. You are not going to testify against someone unless you are sure of what you are saying. Two, it would give innocent defendant greater confidence that they will hear a not guilty verdict. When the incentive to lie is taken away the innocent are usually set free. Last week I noted that any return to Biblical justice requires a return to God’s Word as our standard. However, merely having our laws built upon God’s Word is not enough. We must have the type of men behind the bench who will keep the laws. I love to say, “We are only as good as the men who rule us.” This is especially true of judges. Unrighteous judges used the law to convict Jesus. (See especially Matthew 26:59-68) In order for godly laws to be effective we must have righteous men holding the gavel. In Deuteronomy 1:16-17 and 16:18-20 Moses tells us what type of men the judges are to be. 1. They are not to show partiality. 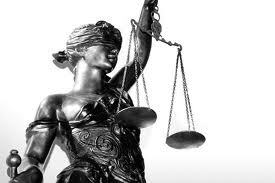 That is why lady justice wears a blindfold. No matter who is coming before the judge he is to show the same amount of care in making a judgment on the case. It does not matter if the man is rich or poor, great or small. Justice must be dealt. In America, we have the rich getting special treatment in the courts because of their money. And the poor getting special treatment because we feel sorry for them. In a biblical system your economic status does not determine whether or not you get a fair trial. 2. They are to fear God and not man. This is why the loss of a higher law is the death of true justice. If there is no law above the judge, he will be more easily persuaded by other men. He will not look to the bar of God where he must give account. But instead will be pushed by politicians or lobby groups or his wife. A righteous judge, like the righteous master in Ephesians 6:9, knows that there is a judge in heaven to whom he must give an account. 3. They must not take bribes. Money or positions of influence or lobbyists or best friends must not influence a judge. He must adhere with the precision of a surgeon to the law. Money makes us blind. How many judges have been put in office because they promised to do this or to do that? How many bought their positions? Bribes are wicked and where they exist true justice is absent. There are many hot button topics, which Christians usually ignore. At the top of my list is the American judicial system. Why do conservative Christians not discuss the judicial system? Why do we assume that a Christian who speaks of overhauling the justice system is a social liberal? Why has all the discussion of this particular topic been left up to the social liberals? With over 2 million adults in prison and the cost of prisons in the billions it is wise for us to think these things through more carefully than we do. What are the basic principles of Biblical justice? I want to discuss of few of these in some blog posts. I will not be able to cover every topic, but hopefully you will get a general overview of what the Bible teaches. Let’s begin with the most basic principle of all. There must be a law governing those who judge and make the laws. The judges and lawyers and prison guards and jury members and congress must all be underneath some other law. Why is this so important? Without a foundational, ultimate law, judgments becomes arbitrary, dictated by the whims of these behind the bench or by the money of those being tried. There can be no final and true justice if there is not an ultimate law to which men may turn. How are we to know what is the correct level of punishment for a man who rapes a woman? How are we to know what should happen to the extortioner without a law outside and above American law or even international law? Are long term prison sentences right? Without an ultimate law, we have nothing to appeal to, nowhere to turn to make sure we are doing right. Without an ultimate law we like a blind driver in a car with no steering wheel. Who knows where we will end up? Some will argue that we do not need God’s special revelation because natural law can guide us. By this they mean the normal ways human beings operate across various societies, our God-given conscience which guides us. However, natural law is too general to be of any real use. For example, most societies and people would agree theft is wrong. But one society might decide that stealing is okay if you are poor. Or that stealing is okay if the other person stole from you. Or that if someone steals they should be hung and their children should be killed as well. Or that stealing is only wrong if you steal from a wealthy man. Otherwise it is overlooked. So while there might be general agreement that something is wrong, natural law does not give us enough guidance to make for true justice. So there cannot be a return to true justice until there is a return to using the Word of God as our guide. This will not be easy. It will require a deep study of God’s Word. And I do not think all Christians will necessarily come to the same conclusions. However, if we use the Bible as our foundation we will a Law above us to appeal to as we make other laws to govern us.